“This is an exciting time for us as we approach top-line Phase 2 data from our TRAXAR clinical trial in renal cell carcinoma in December and interim Phase 3 results from our TAPPAS trial in angiosarcoma in the first quarter of 2019,” Dr. Charles Theuer, president and CEO, says in an interview with BioTuesdays. The company also expects to receive Phase 2 data in mid-2019 from its partner, Santen Pharmaceutical of Japan, which is testing TRACON’s DE-122 drug candidate in combination with Lucentis for the treatment of wet AMD. In addition to its internal product development, Dr. Theuer says that as a start up, TRACON realized that it was spending too much time and money for services from contract research organizations. For example, the adaptive design of the company’s Phase 3 TAPPAS trial in angiosarcoma was published in the peer-reviewed, Annals of Oncology, in October 2018 and was recognized as the most innovative trial of 2017 by Clinical and Research Excellence Awards. In the first quarter of 2019, the company plans to announce an interim analysis of 120 patients from the pivotal TAPPAS trial of TRC105 in combination with Votrient, an approved VEGF inhibitor, which is used as a second line treatment after chemotherapy. “On its own, Votrient has limited survival benefits in angiosarcoma, so clearly patients need something added to Votrient,” Dr. Theuer suggests. Based on the interim analysis, the adaptive design would allow the Data Monitoring Committee to recommend that the trial continue as planned to enrol 190 patients, if a highly robust treatment effect is being seen; increase the sample size to 340 patients in order to improve the chances of seeing a clear treatment effect; enrol 220 patients if only patients with cutaneous angiosarcoma are responding; or stop the trial if no treatment effect is being seen. Angiosarcoma is an orphan cancer disease of the inner lining of blood vessels, with about 1,800 annual cases in the U.S. and Europe, and a greater incidence in Asia. TRACON estimates a market potential of more than $100-million in angiosarcoma in the U.S. and Europe. “We are encouraged by the rapid rate of patient accrual into the Phase 3 TAPPAS angiosarcoma trial,” he adds. Angiosarcoma represents a high unmet medical need, with a five-year survival rate of less than 12%, compared with a five-year survival rate of about 56% for all soft tissue sarcoma. Patients in the TAPPAS study are being randomized one-to-one to receive TRC105 plus Votrient in a treatment arm versus Votrient alone. The primary endpoint is progression free survival. TRC105 is an anti-endoglin antibody. Endoglin is a protein overexpressed on proliferating endothelial cells, which is essential for angiogenesis, the process of new blood vessel formation. TRC105 has received orphan designation for the treatment of soft tissue sarcoma in both the U.S. and EU. “Our initial development strategy with TRC105 is to achieve regulatory approval in an orphan indication like angiosarcoma, where there is a large unmet medical need, and then follow up in larger markets like renal cell and hepatocellular carcinoma, and ultimately even larger markets like lung and breast cancer,” Dr. Theuer points out. In December, TRACON plans to release top-line data, including progression free survival, with biomarker correlations, from the randomized Phase 2 TRAXAR trial of TRC105 in combination with Inlyta, another approved VEGF inhibitor, in patients with advanced or metastatic renal cell carcinoma. TRC105 also is being studied in a multicenter Phase 2 trial combination with another VEGF inhibitor, Nexavar, in 33 patients with hepatocellular carcinoma to confirm the 25% response rate seen in a earlier Phase 1/2 study conducted by the NCI. Interim data presented at GI ASCO in January 2018 showed partial responses in two of the first eight patients, matching the response achieved by the NCI. Dr. Theuer says additional data from the study is expected at GI ASCO in January 2019. In 2017, TRACON inked a licensing agreement with China-based Ambrx to develop and commercialize TRC105 for oncology indications, with an initial focus on hepatocellular carcinoma, in China, Hong Kong, Macau and Taiwan. Another important read out for TRACON is Phase 1b safety and efficacy data of TRC105 in combination with Opdivo, a checkpoint inhibitor, in patients with non-small cell lung cancer, which is expected in December. “This is our lead approach in immuno-oncology, where we have very strong preclinical data,” Dr. Theuer says, adding that the trial is expected to move into the Phase 2 portion in 2019, with two cohorts: Opdivo naïve and Opdivo relapsed patients. TRACON’s other product candidates include DE-122, an ophthalmic formulation of TRC105 designed for wet AMD, which has been licensed to Japan’s Santen Pharmaceutical. Santen’s Phase 2 AVANTE study with DE-122 is currently enrolling patients, with data expected in mid-2019. Patients are receiving Lucentis plus a sham, Lucentis plus a low dose of DE-122, or Lucentis plus a high dose of DE-122. The primary endpoint is best-corrected visual acuity following six monthly intravitreal injections. Dr. Theuer says the National Cancer Institute currently is funding Phase 2 clinical testing with another TRACON oncology asset, TRC102, which is being combined with several chemotherapies as a possible treatment to reverse resistance of chemotherapy. The focus of these TRC102 programs is to identify a biomarker that will correlate with response to treatment with chemotherapy and TRC102. “We expect to see data in mesothelioma and solid tumors in 2019,” he adds. Dr. Theuer says TRACON’s ability to conduct its own clinical trials led to an in-licensing deal in 2016 for two Janssen Pharmaceutical drug candidates: TRC253 for the treatment of metastatic castration-resistant prostrate cancer, which has now moved into the Phase 2 portion of a Phase 1/2 trial; and TRC694, a first-in-class treatment for myeloma, which is expected to begin human testing in 2019. As part of the deal, Janssen made an equity investment in TRACON. 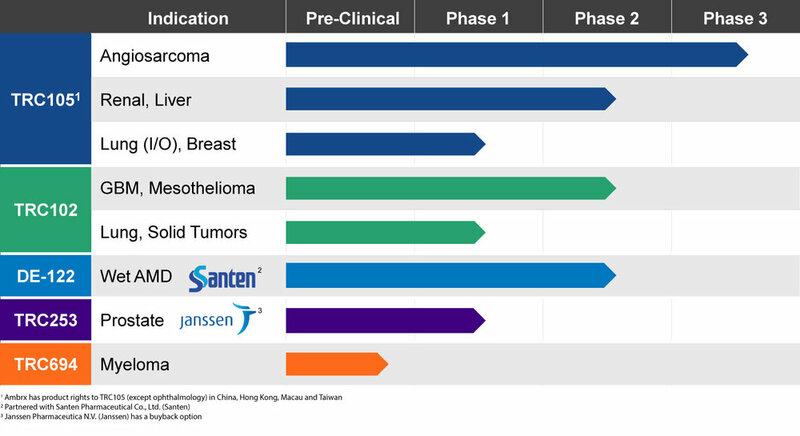 Following the Phase 2 study, Janssen has rights to re-acquire the prostate cancer drug candidate, with TRACON entitled to receive $45-million in cash, $137.5-million in future milestones and low single digit royalties. Under the deal for TRC694, Janssen has a right of first negotiation after TRACON completes a Phase 1 study. If TRACON retains rights to the myeloma drug candidate, it would owe Janssen development and regulatory milestones of up to $60-million and low single digit royalties. To connect with TRACON, or any of the other companies featured on BioTuesdays, send us an email at editor@biotuesdays.com.